Having faced with an issue of overweight, you must have heard that the heavier you are, the more pressure on your joints there is. But do you actually know how to cope with that, or at least alleviate the load on feet and therefore prevent possible injuries, avoid pains caused by flat feet, overpronation, plantar fascia, supination, knee problems, which often come in a company with those extra pounds? Starting a walking program is a great step to take in improving your health, however, remember to do it wisely. Unless you wanna get an opposite effect, take the choice of walkers seriously. Don’t know what to look for? Scroll down and you’ll definitely find something useful there. How to Buy the Best Walking Shoes for Obese Women? FAQ: Why Do I Keep Gaining Weight? Meet another super-comfy pair of non-athletic shoes on our list. Classic external design with no twists, outstanding details – if you’re a fan of simple, high-quality, and comfortable footwear that fits any outfit, these Skechers Equalizer Persistent Slip-On Sneakers are the option you’re gonna be happy with. Thanks to SKECHERS looking this great has never been this easy – says the company’s motto. And they’re absolutely right! Simple design with no pop-ups. Smooth faux leather breathable upper. Slip-on comfy design without any laces. Flexible outsole with good traction. Arch support can seem not enough for severe pronators. No wide sizes are available. Heavy walkers surely know all those foot problems like plantar fasciitis, overpronation, supination, knee pain, that arise because overweight puts more pressure on feet. Their 6th edition of Gel-Venture model is the shoe that totally proves it. Despite these sneakers initially were meant for running, heavy guys feel a way more comfortable wearing the Gel-Venture 6 than wearing most walking shoes available on the market. Rearfoot GEL cushioning system in the midsole guarantees a high-energy return, maximum shock absorption, a smoother heel-to-transition, and a well-cushioned in-shoe environment in general. So, thanks to footwear technologies, the body weight is being spread all over the foot preventing them from getting the usual amount of exhaustion. Mimics the natural form of the human foot. Features a strong build – great for heavy walkers. Extra reinforcements on the sides and supportive heel collar. Removable insole: you can accommodate a medical orthotic you need. Reversed lugs on the outsole enhance the grip on different surfaces. AHAR rubber for durability and flexibility. Good air circulation and a healthy environment inside the shoe. Strong build of the sneakers makes it a bit heavy. Brooks Adrenaline GTS 18 has the right amount of firmness and cushioning, that makes a perfect stability shoe. Faster movements without pain are not a dream anymore! BioMoGo DNA foam adjusts to the specific wearer’s foot. Progressive Diagonal Roll Bar makes the heel-to-toe transitions smoother. Good for everyday wear, as well as short and long-distance running. Wide toe-box for a natural toe-splay. A full range of widths is available: from narrow to wide. Cool sleek design in lots of colorways. Fit great right out of the box. A slight rubbing against the small toe is possible. Brooks has a fame of a company that always knows for sure what exactly this or that foot needs, and this revolutionized Brooks Addiction Walker is another proof of that. Unlike the New Balance 840, which can cope only with low-intensity workouts (walking), this Brooks has the fit and feel of a running shoe but is specifically designed for walking. This sneaker prevents the feet both from turning inward and outward, eventually minimizing the risk of injury or painful feelings in legs, knees, and feet. Brooks Addiction features super sturdy, slip-resistant sole, which makes it perfect for overweight women and men. Sturdy and very well built, using high-quality materials. Created specifically for overweight people. Available in full-grain leather and nubuck interpretations. Great cushioning and shock-absorption (HydroFlow, MoGo, Cushsole). Environmentally-friendly silica compound used on the outsole (Durable HPR Green). The design is not very appealing. Typical bulky construction of an orthopedic sneaker. Despite the name of Propet shoe is not so loud and well-known as Nike, Adidas, or Puma, this brand is definitely worth our attention when it comes to heavy walkers. Unlike most companies, in addition to creating a shoe that will comfortably support the weight, Brooks also care about protection feet and joints of overweight person from any abuse. Besides, this sneaker deals with such common foot issues as flat feet, overpronation, and joints pain. The Propet Stability Walker is meant to improve the quality of heavy walkers’ lives – and that’s the main reason to choose it. Designed with a wider forefoot for a stable stride. Perfect for walking on all surfaces. Rigid heel counter prevents feet exhaustion. Speed lacing lace-up closure with “D” rings. Full grain leather and nubuck upper options are available. Properly-padded tongue and collar for comfortable fit. The brand isn’t very well known. New Balance MW411v2 walking shoes are a great option for heavy guys who like classics. Their simple sleek external design, represented in 6 basic colorways probably won’t be appreciated by fashion-hunters, but will definitely become a favorite for overweight people who don’t wanna show off a lot. The incredible comfort of the model is guaranteed by plush interior, tongue, collar, the mixture of good cushioning technologies: Cush+ and ImEVA, and updated support mechanisms that help relieve and even avoid the pain and pressure your feet suffer from. Cush+ & ImEVA cushioning technologies for proper shock-absorption and better heel-to-toe transition. Removable insoles: you can easily adjust your medical ones. Highly breathable thanks to mesh lining and perforated areas on the upper. Durability is awesome (solid upper leather materials and sound rubber on the outsole). Not true-to-size (runs a half size smaller). Only 6 colorways are available, without any twists. What makes the GEL-Kayano 24 Running Shoe so suitable for overweight people’s walking experience? It’s the fantastic comfort it offers in combination with a snug secure fit. Yes, these long-distance running shoes are a solution for almost every possible feet problems (and, obviously, heavy women do face these painful conditions more often). As soon as you put them on you can barely feel the Kayanos on your fit – that’s all thanks to unique FluidFit technology for a glove-like fit and very lightweight, soft construction. But as soon as you make your first step, you’ll feel fantastic support, multi-level cushioning, and exceptional comfort. If money is not an issue for you, Gel-Kayano 24 is the best option possible! Great for bad knees, plantar fasciitis, ACL injury, back problems, IT band, overpronation, and similar painful conditions. Bright and cool external design with lots of colorways available. No break-in period is required. MetaClutch external heel counter for support and locked heel fitting environment. A mixture of the best cushioning and shock-absorbing systems in one shoe: Guidance Trusstic System, GEL Cushioning System, FlyteFoam Technology, and FluidRide Technology. Removable Ortholite X-40 Sockliner can be replaced with your orthotic. Great gait efficiency thanks to the Guidance Line Technology. Good grip on the variety of surfaces. Issues with the Flex point of the foot are possible (but it depends on the size). Meet another pair of New Balance athletic shoes that are also ready to support overweight person and push them to new sports horizons. These are MW840 Health Walkers, which not only feel super comfy thanks to the cushioning but also help solve a lot of foot problems that come with being overweight. Having sunk your feet into the New Balance 840, you’ll be able to walk without the tiniest fear of the consequences that come in a company with a bad shoe choice. Wanna walk like on cloud nine – these healthy shoes from New Balance is exactly what you need! Wide width available = perfect for overweight people and wide feet. Recommended for overpronators and people with plantar fasciitis issue. Durable full-grain leather on the upper, durable sole compound, durable lining material. A rather bulky silhouette and not stylish orthopedic appearance. Only 2 colorways are available (black and white). Too roomy heel area can result in minor slippage. Can be worn only for walking, not running or jumping. The New Balance 990v4 is the sneaker that mixes excellent foot support, cushioning, and great design – exactly what heavy men want. This iconic shoe’s 4th update features roomy toe-box and, while the midfoot part still conforms to the foot. Thus, the fit of the sneaker is maximally adjusted: a tighter center fit, extra space in the back of the foot, and natural toe splay without pressure in the forefoot. Additional cushioning and arch support of the New Balance 990v4 minimizes all the possible pain and discomfort you might feel in the process and after prolonged walking. Variety of widths are available: from narrow to wide. Great ankle support that prevents rolling. Abzorb crash pad makes the heel strikes much smoother. ABZORB midsole and Dual Density collar. Flexible sole easily contours to your feet. A mix of leather and mesh in the upper for reduced weight without sacrificing the quality. The lace keeper – a small detail that makes a big difference. There’s rubber odor at first. Despite these Skechers don’t look like traditional sneakers, they’ve managed to grab top positions on the Amazon among heavy walkers. And no wonder! It’s all because Skechers Performance Go Walk 4 can give everything overweight people want from their everyday shoes: fantastic comfort, lightweight, anti-bacterial odor control, high responsiveness along with secure stability system. Yes, all this functionality, support, and style fit in the Go Walk 4, which are easy to slip on and show off your sense of fashion. Increase your walking time without getting tired in these cool Skechers, which are definitely worth the money. Removable bamboo lined footbed for proper moisture and odor control with an antibacterial effect. Innovative highly responsive 5GEN cushioning technology. Quick-Fit Portal for easy put on. Highly breathable, lightweight, and comfortable upper construction. Tapering midfoot design seems to be not enough for the perfect arch support. Steel waters run deep – that’s exactly what should be said about the new GT-1000 6, which hide lots of awesome advanced features under its simple design. These sneakers are deceptively roomy, which is especially great for heavy person. Also, they’re made of new generation lightweight and breathable mesh that helps to keep the pressure off the foot and avoid odor and sweating. As for the cushioning and energy-return, this famous brand has done a lot to make it perfect: SpEVA midsole material, rearfoot GEL cushioning, Guidance Trusstic System and the ComforDry sockliner on the inside work together to absorb the impact, make every step secure, keeping your joints from overloading. Simple but functional external design. Incredible support thanks to the Dual-density DuoMax Support. Seamless construction – no irritation. Great gate efficiency (the Guidance Line). The removable ComforDry insole for cushioning and moisture wicking. Very durable midsole and outsole materials. Too roomy: order a half size smaller. A toe box is a little bit narrow. 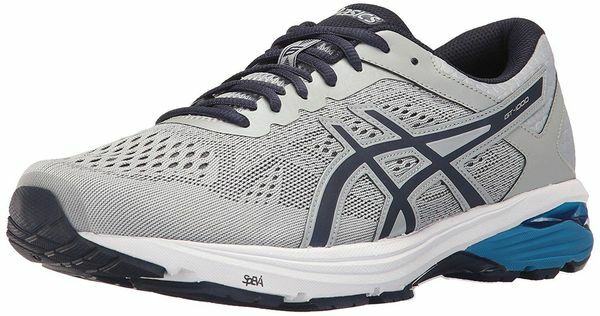 If you spend most of your day on your feet, suffer from overweight, and require ideal arch support, comfort, and pain relief from your sneakers, this updated version of Gel-Contend 4 could be a good choice for you. In these sneakers, you’ll enjoy your safe walking experience without the risk of injury, pain, or overpronation. Also, you’ll say goodbye to heavy feet feeling, knee pain, feet pain, and fatigue. Good news: Gel-Contend 4 belongs to a budget sports footwear category, so you’re not gonna pay the fortune and get one of the most reliable and sturdy options available on the market today. Attractive external design, available in multiple color options. Overlays in the heel and the midfoot areas for stability during the motion. Good breathability and moisture management. Rearfoot GEL Cushioning System in the heel for a lower shock. The shoe may fit a bit lose. Small issues with durability are possible. The “9” at the end of “Saucony Cohesion 9” says that this shoe is worth updating and re-releasing again and again. Yes, this model has been transformed a lot since the first edition of the Saucony Cohesion line, and numerous new technologies were added, but this is possible only when the core is good enough to be invested in. The Cohesion 9 is a must-have for heavy hikers, as it can help with numerous foot issues and painful conditions. Moreover, the Saucony Cohesion line is recommended by the podiatrists association, which makes this budget-friendly shoe a win-win choice. Different width options are available. Durable sole and upper materials. Lots of colorways are available. Adequately soft and responsive cushioning system. Good traction on various surfaces. Removable insoles allow for adjusting yours. Able to relieve muscle pain or discomfort in the foot. The upper construction looks a little bit bulky. Bad grip when it’s raining. Gel Cumulus, one of the best-selling brand’s walking shoes, are well-known among overweight hikers as the shoes that offer great cushioning and support to your feet whatever you’re doing. An incredible amount of cush technologies are used in this model: from midsole GEL material and Impact Guidance System, to the Comfordive Removable Sockliner, providing extra padding and wicking moisture for a cooler, dryer, and healthier in-shoe feel. The model has lots of space on the inside, so heavy men will definitely be pleased with a purchase like this. There are extra widths for heavy walkers. Enough space for placing your favorite orthotics. Heel counter provides stability and prevents overpronation. FluidRide midsole as well as Rearfoot and Forefoot Gel Technologies attenuate shock and soften the impact. Reliable arch support and gait efficiency thanks to Trusstic Technology. Independently placed discrete eyelets disperse lace tension, creating a customized fit and enhanced comfort. The toe box is not roomy enough. Durability issues in the upper near the toes. Runs a ½ size smaller. The break-in period is sometimes required. The second, updated version of the New Balance 1540 is a motion control road running shoe that offers incredible comfort both to casual runners and to heavy guys. Thanks to its dual-density foam at the collar, soft fabric lining, plush tongue, and removable cushioned footbed, this model hugs a foot with fantastic healthy comfort and support. Moreover, the New Balance 1540 V2 is designed for heavy people who have flat feet and tend to overpronate, it’s Medicare improved. Do you need any other guarantee? Rollbar prevents any rearfoot movements. The lightweight construction of the upper and the sole unit. Rubber units for maximum durability on the high wear areas of the outsole. Roomy toe box makes most wide-footed runners satisfied. Poor choice of colorways available. Remember that inspiring “I can do everything” feeling? That’s exactly how you gonna feel after even a 30-minutes’ walk per day. Such daily routine can distinctively affect your body and health (dropping blood pressure and cholesterol levels, for example), and as a bonus, release endorphins, boosting the overall mood until the evening. However, being overweight puts a way more pressure on joints and feet, leading to all kinds of foot problems. That’s why wearing special walking shoes that were designed specifically and do work for heavy walkers, is an issue of really great importance. Gaining extra weight can be very problematic for all people, especially for women. It’s not only about the appearance but also about the health and comfort of a person. Even a few additional pounds can disappoint a woman, while too many pounds make a person feel the discomfort of different types: beginning with the choice of clothes up to a bad state of health. Heart, breath, knees, and feet… (this list can be expanded even greater) are always influenced first and foremost. Thus, walking becomes a good decision not only for losing extra pounds but for prevention this problem. That’s why it’s very important to pay much attention to the walking shoes for women, who suffer from being overweight. Have you already made a decision to use every appropriate moment for walking? In this case, you need to know a few simple rules of how to buy walking shoes for a heavy person. Don’t hurry to buy walking shoes through internet shops until you try them on. For obese women, it’s important to know if shoes cause any discomfort: all extra weight is lying on the feet. Before buying any walking shoes, decide what sports company (or brand) you trust more (perhaps, you have experience, wearing shoes of some of them). Identify the most important features of walking shoes, which are essential and even vital exactly for you. You may also examine some feedbacks and customers’ reviews about different walking shoes. However, remember, that we are all different, and what is great for one is absolutely inappropriate for other. And, of course, be ready to spend money on your walking shoes. Low-cost shoes will unlikely become a good choice. Some companies offer rather budget-friendly deals, however, they’re still not very cheap. There cannot be any mistake in the size of walking footwear. Be careful if many customers say that the model is not true to size – take that fact into account. Pay attention to the arch of your feet. Flat feet walking shoes and shoes for those, who have high arches, have different designs. As a rule, overweight people have wide feet, so you have to check the width of your feet along with the same for the shoes to make sure that they will suit you. P.S. If you are afraid of making a mistake, just ask for help from a salesperson or shop assistant at any sports store. And remember that you can always exchange your shoes. Although it’s vital to find walking shoes for overweight walkers, it’s also difficult and confusing. As a matter of priority, we have to decide what kind of shoes to look for. The variety of sports shoes for walking, designed for obese women will impress everybody. New Balance, Skechers, Saucony, Brooks and many other sports companies have special types of walking shoes for overweight women. In addition, all of them have supplied their walking shoes with all necessary features and technologies. Thus, these walking shoes will definitely provide you with great support. Rubber walking shoes will give you waterproof defense; shoes with the open mesh will create a well-ventilated environment and moisture-management for your feet; shoes, possessing a heel clutching system are a good choice to have supportive footwear. So, what kind of shoes to look for a heavy person, and what to pay attention at first? Nobody can argue that the priority of any walking shoes is to be comfortable. Stable and flexible sole, which is able to provide your knees with support and prevent your lower back from the pain, is the primary feature of the right pair of walking shoes. A good cushioning will always be in a great demand among overweight walkers. Walking shoes must not be heavy (no matter what they are made of). Lightness is everything you must feel, wearing them. The reliable and stable walk is what you have to wait for from ideal walking shoes for heavy women. In addition, walking shoes should maximally breathe: a constant air circulation will not allow your feet to overheat, smell, and sweat. Every step is gonna be smooth if your walking shoes are perfect! You do everything possible to be slim, but all your efforts have no result. Does that sound familiar? Unfortunately, there’s nothing new for lots of women. Sometimes it’s really challenging to find out why this or that person keeps gaining weight. Moreover, in some cases, healthy food and physical exercises are not enough to lose extra weight. Thus, you’ll not get the desirable results until identifying the real reason for gaining weight. First of all, your thyroid is likely to become the source of weight problems. It’s up to the doctor to determine if you have problems with thyroid and what to do with it. Also, don’t forget about the importance of the water you drink every day. Although the daily total water intake is about 2.7 liters for women, it should be increased in some separate cases. The time, when you drink water, is also important. It’s better to do this before you want to eat something, not after. Check up all food you eat (especially its quantity). Healthy food does not always mean diet. Your mental and emotional state plays a really essential role on your way to the ideal figure. The negative way of thinking prevents you from losing weight, vice versa, it makes you keep gaining even more pounds! You have to be self-confident and believe that everything you do will be efficient. Of course, don’t forget that not all exercises are aimed to help you to lose weight. Some of them are created to get bigger muscles, which will increase the number on your scale. In this regard, you don’t have to be afraid of walking (muscles will unlikely appear, but extra weight will go away for sure). Never despair if you have any problems with additional weight. There always is something you can do about this – a kind of way out. If you have already found out that gaining weight is disturbing you, move on to the physical exercises. Walking is a great way to fight with extra pounds. It’s an easy and really effective way to solve this problem. In some cases, walking may be too difficult and exhausting even for people, who aren’t overweight. Remember that a lot depends on your walking shoes. Perfectly selected hikers will make every step more comfortable and efficient. Just pay attention to what you put on, and you’ll do your feet a favor, indeed. Find your best shoes and enjoy every single movement!